Less than a week a go, my darling came home from a two months long trip abroad. I did go visit him in February, but it´s so nice to have him back! My mission this year is to make him the perfect shirt. He was supposed to get a nice white dress shirt for Christmas last year, but when I started measuring him, and comparing these measurements to the one´s in the pattern I was using, I quickly understood that I didn´t have a clue on what I was doing. I have somehow wound up with a body that has the exact same proportions as many big pattern company´s draft their patterns from (that is hip to waist, waist to chest, crotch length etc), so the only pattern adjustments I need to do to make things fit on me, is usually a FBA, and adding length to pants and skirts. Now for my man, he is in a whole other division when it comes to alteration needs. First of all, he is two meters tall, and just that little issue is causing some major alteration needs. To make things clearer for you, here are the measurements for the biggest size from Burda, compared to his measurements. The thing is that these measurements involve some major grading of pattern. But they don´t take into consideration HOW everything looks – like shoulder to shoulder measurement for instance. When I tried to tissue fit the yoke from the pattern I was using (McCall´s 2447), on my man, nothing seemed to be in place. His upper back and shoulder area looks completely different from what the pattern piece did! So making clothing for him really sets my skills to the test. Hopefully I´ll learn a great deal from this! The first thing I did, when realizing I wouldn´t be able to finish the shirt in time for Christmas, was to order the book Shirtmaking, by David Page Coffin. I´ve heard wonderful things about this book, and I must say, I really enjoy reading it. There is a lot of “AHA” and “is that so” when I read it. Coffin is a big fan of pattern alterations (even drafting your own patterns), and stresses that a good yoke pattern piece really is what matters for making a shirt with a good fit. So this will be my first task, take the yoke piece from my pattern, and alter it to fit my man. I am now using Negroni, we both really like this style (like everyone else, ay?) and conveniently enough, MPB had a sew- along not so long ago using this exact pattern. Perfect! I´ll also scan through Tasia´s excellent and thorough tutorials on this matter, she made a very pretty shirt for her man for Christmas (and made it in time;-). I do have some good shirting fabric for this project. Hopefully I´ll be able to whip up some short sleeved shirts just in time for spring. 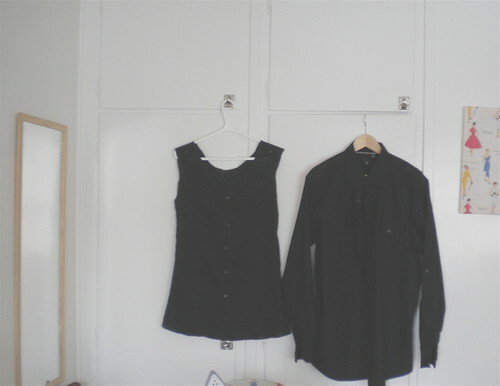 For the first “trial shirt” I´ll use some cheap cotton shirting I got here in Sweden a while back. I bought 4 meters, so that should be enough for a couple of short sleeved trial&error shirts. When I went to New York earlier this winter, I of course made a little trip to the garment district. I went to Mood Fabrics (what a wonderful staff! 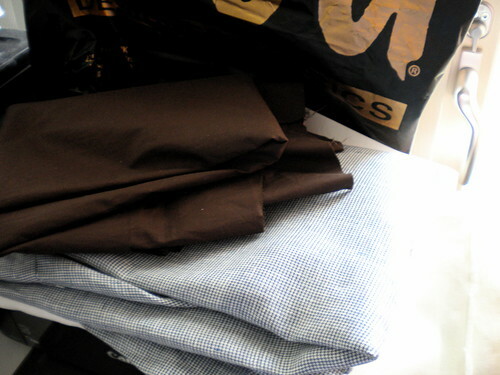 ), and bought some lovely fabric there, I got my darling to come with me to pick out fabric for his shirts. We got a solid brown cotton shirting, a solid white, rather densely woven linen fabric, and another linen fabric with teeny- tiny houndstooth on it. Sooo nice! With all these planned me-made shirts (and some shirt shopping in the big&tall departments in various american stores), it was time for my man to do a little de-cluttering in his wardrobe. Let me tell you, this man is not oblivious to what he wear (thank goodness), and has got a rather impressive wardrobe as it is. Last night he decided to get rid of some of the shirts he no longer uses, and I could all of a sudden add 9 men´s shirts to my refashioning stash. Yay! Hopefully you´ll see the results of that work here in the coming months. What about using one of his discarded shirts to make a pattern from? It might take a lot less time to unpick the seams and trace the pieces rather than pattern fitting, since you already know it fits. Welcome back to your honey! Wow, 2 months is a long time!!! I love that refashion you linked to share! Good luck in your men’s shirt sewing, I need to make one for my husband but he is very particular in how things fit him so it would be a big endeavour. I’ve finally managed to make jumpers that fit him perfectly but somehow that comes a bit more easily to me than pattern drafting. Yes, I know, two months are much longer than you´d think, isn´t it? You´re such an amazing knitter, Kristen. I´m very impressed by your skills! 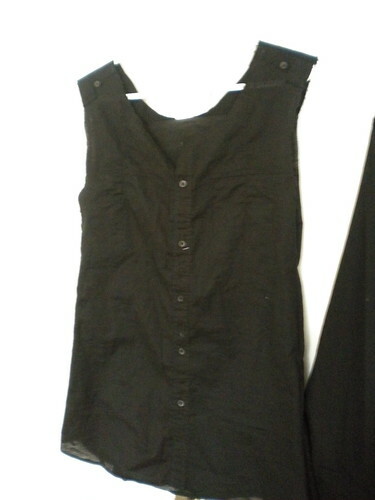 I used a Mans X-large shirt to make a muslin for newlook 6808 it just fit with the short sleeves 🙂 I found a few shirt re-fashions on you tube and here are some i have saved…. hope the links work ok!